Today I got up and was determined to bake something I’ve never baked before. It was pretty daunting because I had so many questions. I thought I would have K as my go to guy for all my questions because he use to be a chef. Unfortunately, baking cheesecakes wasn’t his specialty. What did I do? Well, I went online to the website of my cookbook (allrecipes.com) to read a bunch of reviews of the recipe I was going to attempt. The Brownie Caramel Cheesecake. Just the name of the thing makes me want to drool! I am so glad that I read them because it sure did help me out. I had to add more of this, bake a little bit less of that, and add a water bath to make it just right. haha! Remember, this is my first time! I started out this adventure deciding to make this cheesecake a few days ago. Then I realized that I didn’t have a springform pan anymore! Well, crap! So, off to Walmart we went in search of this specialty pan that I probably never use again unless this cheesecake turns out ok. Remind me to NEVER go to Walmart that close to Christmas again! Good heavens! It was chaos and nearly pandemonium and I’m so surprised that K was actually willing to take me there to get the pan AND more yarn! I’m set for a whole month now with yarn aplenty! Now that my cheesecake is done and it took MUCH longer than I thought it would, I’m a little tired. But dinner at the in-laws in in one hour. I’m pretty much ready to go. I’m just writing this blog entry to destress. I tried lying down with my bipap on but my mind was too wound up to relax. Too much worrying about drizzling caramel and hot fudge topping on the cooling cheesecake. Please, please, please let this be edible! 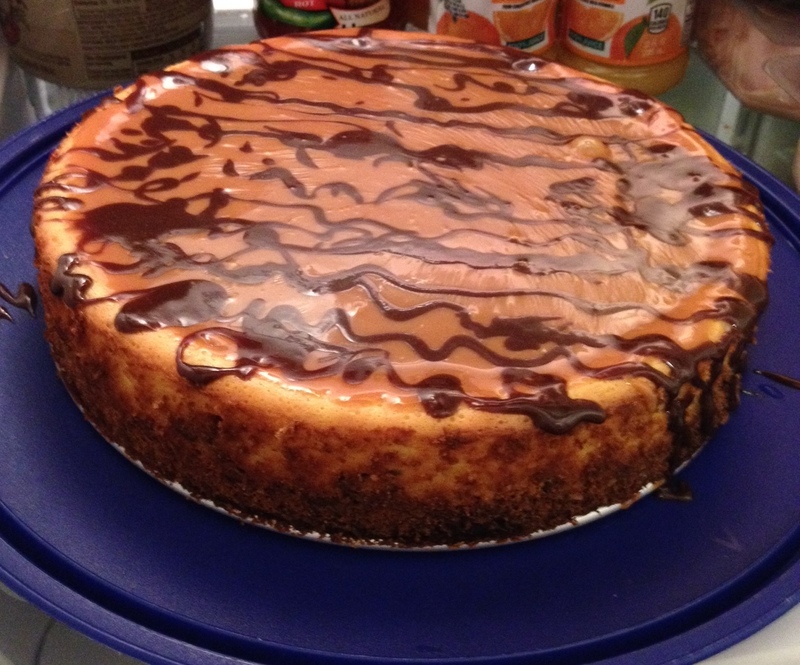 Here’s a picture of my cheesecake. I hope it looks as good when cut into. hehe! May you all have a glorious and Merry Christmas!